VintaSoft Imaging .NET SDK is the impressive and easy-to-use imaging library for viewing, editing, converting, printing and saving images and PDF files in .NET, WPF and WEB. Open architecture of image codecs allows to decode and encode images, get image metadata, use low level features of image file format, create custom codecs. SDK has built-in codecs for the following image file formats: BMP, DICOM, EMF, GIF, animated GIF, Icon, JBIG2, JPEG, JPEG-LS, JPEG2000, PCX, PDF, PDF/A, PNG, TIFF, multipage TIFF, WMF, RAW (CR2, CRW, DNG, NEF, NRW). SDK provides the ability to capture images from web camera.Images and PDF documents can be viewed in scrollable image viewer, thumbnails can be viewed in multi-threaded thumbnail viewer. Image viewer functionality can be extended with built-in visual tools (magnifier, pan, zoom, highlight, rectangular or custom selection, etc) and user visual tools. Viewers are available as WinForms, WPF and Web controls.Supports 90+ image processing functions (despeckle, deskew, border clear, blank page detection, binarization, segmentation, mirror, invert, color conversion, resample, change resolution, brightness, contrast, hue, saturation, etc) and allows to create custom image processing commands. 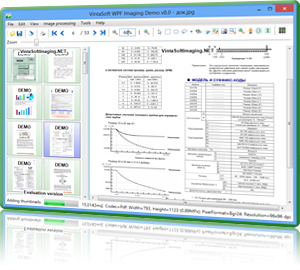 Also SDK contains built-in color management system.VintaSoft Imaging .NET SDK is a core component that can be complemented with the functions of connected Plug-ins: Annotation - allows to annotate TIFF, PDF, JPEG and PNG files. PDF - allows to create, load and edit PDF documents. JBIG2 and JPEG2000 - allow decoding/encoding JBIG2 and JPEG2000 files. Document Cleanup - allows to cleanup images. OCR - allows to recognize text from image. Forms Processing - allows OMR and document recognition.SDK contains pure .NET 2.0/4.0 and WPF 3.5/4.0 assemblies which can be used in any WinForms, WPF, console, service, ASP.NET, HTML5 application.SDK was tested and has examples of use in Visual Studio .NET 2005-2017 for VB.NET, C#, ASP.NET. imaging, .net, wpf, web, library, sdk, component, document, image, processing, viewer, thumbnail, jpeg, pdf, tiff, winforms, file, metadata, print, save, load, annotations, jbig2, jpeg2000, cleanup, ocr, omr, forms, dicom, vb.net, c#, asp.net, mvc VintaSoft Imaging .NET SDK - an impressive imaging library for .NET, WPF, WEB. WinForms, WPF, WebForms controls for image viewing. 90+ image processing functions. Annotation, JBIG2, JPEG2000, PDF, DocCleanup, OCR, DICOM, OMR/Forms Plug-ins available.